If you’re looking for a cross trainer that offers a smooth performance, challenging resistance and durability, the Kettler Cross M may just be the right choice for you. Known for their superior quality and durability, Kettler is a respected name in the fitness industry, and the Cross M is built to the highest of German standards. In this review, we’ll take a look at what the Cross M has to offer, and whether or not it’s worth buying. Pulse Sensor to monitor heart rate. Free tension control with a 1.9 KG flywheel. The Kettler Cross M is a cross trainer that’s a bit more expensive than other home cross trainers we’ve reviewed, but its smooth performance and challenging resistance make it worth the extra cost. The overall construction and durability of this machine is superb. It’s built to meet the highest German standards (TUV), it’s quiet, and it’s smooth as can be. The fluid motion is thanks to the large 12kg flywheel, 16” stride and the disk joint’s pendulum ball-bearings. 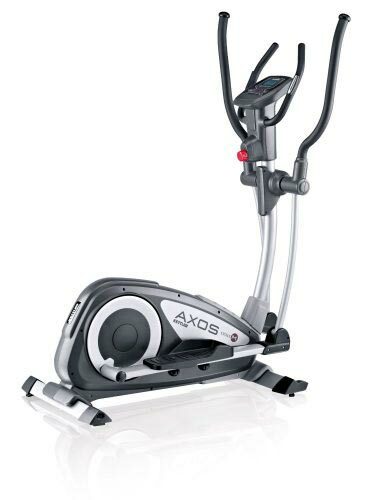 When working out on this machine, you’ll be able to track your fitness level every time with the fitness recovery test. This allows you to track your progress over time to see how effective your workouts are. 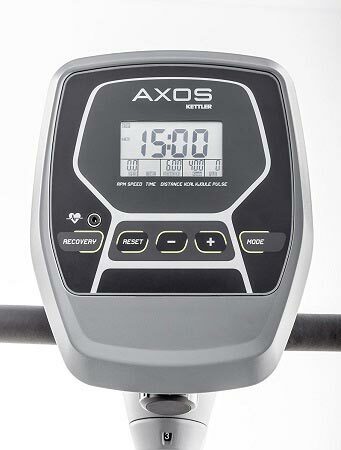 You can also track the calories burned, time, distance and speed through the console. Although this machine has multiple resistance levels, Kettler states that this model is designed for beginners who want to jump right into their new fitness routine. However, with 8 levels of resistance, you’re sure to get a great workout even at the intermediate stage. The resistance level is easy to change, too. Simply turn the red dial that’s situated right under the center console. If your workout proves to be too challenging and you exceed your maximum heart rate, a light (located on the console next to the heart icon) will blink to alert you that it’s time to slow things down. The pulse sensors on the handles will help you keep track of your heart rate during your workout. One thing I do have to mention is that you will need to put this machine together. It’s relatively simple, but don’t assume that the Cross M will come fully assembled – it won’t. The only drawback with the Cross M is that it has to be assembled. However, most cross trainers do not come fully assembled, so assembly is to be expected. The Kettler Cross M is one cross trainer that I never hesitate to recommend to both beginners and intermediate users. It’s well-built, affordable and offers just the right amount of features to make your workouts effective.